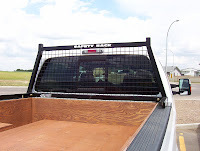 A Backrack is a great choice for today's truck as it not only provides great protection for the back window, it also has optional accessories you can attach to it like a light bracket. The Backrack mounts in the trucks stake pocket so no holes to drill. 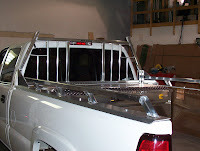 Backrack also provides a rear bar that also mounts in the stake pocket for carrying ladders or pipe. Visit the BackRack web site for more details. 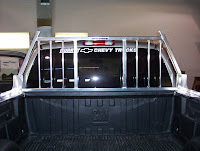 This is another version from Backrack that has a full mesh to protect your rear window. The safety rack also comes with a wide variety of accessories to enhance it function. This headache rack is not only functional, but also looks great. It is made out of aluminum and polished to give it a great finished look. It is attached to the truck using a gusset, or bracket. 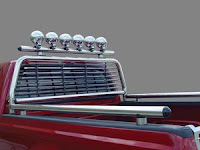 This headache rack is the same as the above aluminum headache, but is attached to the vehicle using a full length rail and bed cap combo. This is a stainless steel headache rack with louvers. 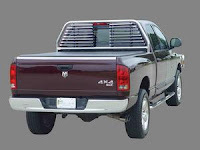 It not only gives your rear window protection from cargo, but also provides a shade for your cab. Visit the Go Industries web site for more information. Above Go Industries headache rack with optional rail and light bar. This is our standard zinc plated headache rack. It comes with the option of either mesh on just the sides or mesh also in the middle. The headache rack can either be mounted with gussets, as shown, or with a full length rail.